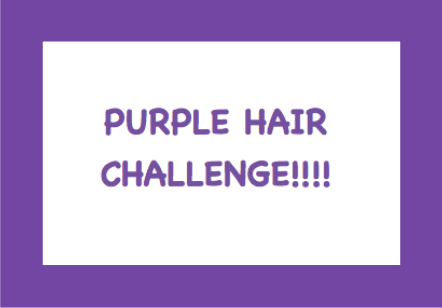 We are SO excited about where we are with the Purple Hair Challenge!! When we started this, we set a big goal of $20,000. But secretly, I had another even bigger goal in my heart: $30,000! When I finally got up the nerve to say it out loud, the Purple Hair Team wholeheartedly agreed to try! Well, I’m happy to tell you we actually have a chance to make it. As I type this, we are at $26,685! With eight days left, we have another $3,315 to go. Can you help? If you haven’t heard, here’s what the Purple Hair Challenge is all about: In honor of Childhood Cancer Awareness Month (September), Team Summer is doing something CRAZY! We are raising money for Team Summer with the promise that we will DYE OUR HAIR PURPLE!!! This whacky idea came from some of Summer’s friends from high school, and they have convinced dozens more to join in! We figure most of our Team Summer kids don’t even have hair, so the least we can do to help them is dye ours purple, right?! Purple was Summer’s favorite color. To support Summer’s friends and all who are following their lead, CLICK HERE and scroll down to find a person you want to support!! There are a lot of good people on the list (two pages!) who are trying HARD to make their goals by the end of the month. Can you help? Even a small donation would encourage them! We are so thankful for all their Team Summer hearts…AND YOURS!